Clearly the embassy-burnings and rabid protests of the Islamic radicals showed that there is a faction in the Muslim world that completely rejects open debate. But the traditional Muslims fell silent. They did not join with the radicals, but neither did they defend the cartoons. And indeed some commented that the way in which the West was treating the controversy was unfair and hypocritical. 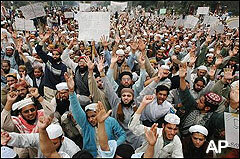 The Imus controversy vindicates the argument of these traditional Muslims. How often during the Imus brouhaha have you heard the words "free speech"? Hardly....No wonder the Muslims are chuckling. They see that when our sacred cows are gored, we scream bloody murder and demand accountability and heads on a platter. By contrast when someone elses's sacred cows are gored, we proclaim ourselves loftily on the side of free speech and demand that they "get over it." How true. Double-standards know no boundary. "we scream bloody murder and demand accountability and heads on a platter": ah, the difference between literally and figuratively. I've been thinking about this, and I believe you're wrong. Freedom of speech has consequences, which may range from being fired to having your country's embassy torched. That does not mean that that freedom should be circumscribed. There is no hypocrisy here. What the cartoon protesters want is for it to be impossible for anyone to publish such things. What the Imus imbroglio shows is that it is possible to say anything you want, as long as you're willing to face the aftermath. The difference is that one approach tries to intimidate free speech by violence or threats of violence, while the other says that you can say what you want, but you might get fired if your audience calls up and complains. Which form of restraint would you prefer? I believe Peter Jackson's put his finger on it. There's the matter, too, of appropriate response. 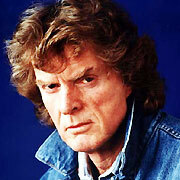 No one was crying for Imus's literal head on a platter. Further the action taken was performed by a non-state actor--the broadcasting companies. Nor did mobs gather to burn down the various stations broadcasting the program. I believe the word I'm looking for is 'proportionality'.